In compliance with Preston Public Utilities adopted rules relating to cogeneration and small power production, the Utility is obligated to interconnect with and purchase electricity from cogenerators and small power producers that satisfy the conditions as a qualifying facility. The Utility is obligated to provide information regarding rates and interconnection requirements free of charge to all interested customers upon request. All interconnections require an application and approval to become a qualifying facility. Any disputes over interconnection, sales, and purchases relative to qualifying facilities should be brought to the Preston Public Utilities Commission for resolution, per the Utility’s Distributed Generation Rules adopted on 02/14/18. Interested customers may contact the Preston Public Utilities Office at 507-765-2491. ATTENTION: The Preston Park Board is accepting applications for LIFEGUARDS for the 2019 Summer season (June-mid August). Lifeguards must be at least 15 years of age and are required to complete Lifeguard training along with the provided CPR/First Aid and orientation classes. Lifeguard training is paid for by the Park Board upon completion of an application and a commitment to work 40 hours per month in June & July and 20 hours in August. Another available option is to be certified as a WSI (must be at least 16 years of age) to teach swim lessons. WSI training is paid for by the Park Board upon commitment to working at least 30 hours as a WSI. Lifeguard wages start at $9.79 with additional wages for WSI when teaching lessons. Applications are available at Preston City Hall. Application deadline is Wednesday, January 16, 2019. At the regular Public Utility Commission meeting on December 11, 2018, the commission voted to raise the electric base and kWh charges by 3% and residential and commercial sewer base and use charges by 10%. This increase will be effective February 1, 2019. The average residential customer will see an increase in their monthly utility bill of $1.93 for electric and $2.62 for sewer. The reasons for the rate increases are proposed capital improvements to the electric and sewer systems. For more information, please contact the PPU office at 507-765-2491. 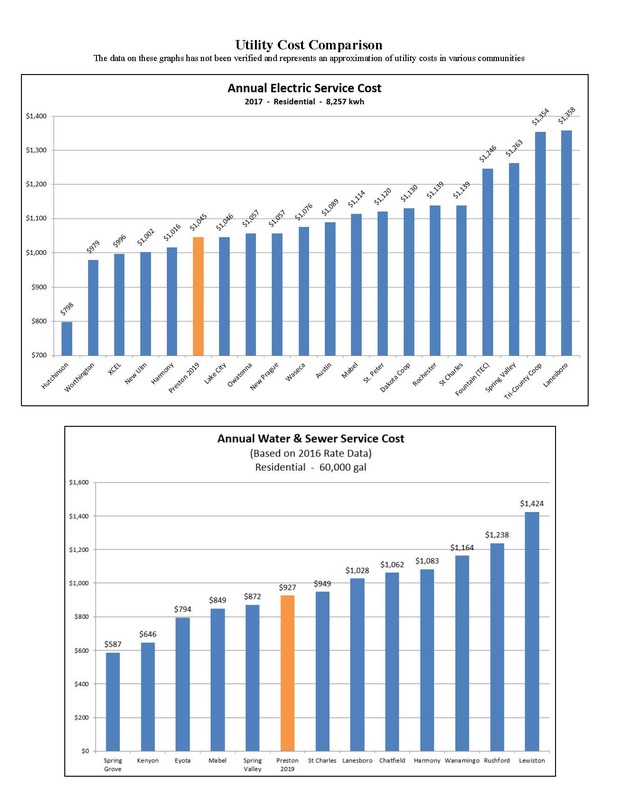 Average PPU residential customer is billed for 536kWh of electricity and 3,021 gallons of water/sewer usage per month based on billing statistics for the twelve months ending November 30, 2018. 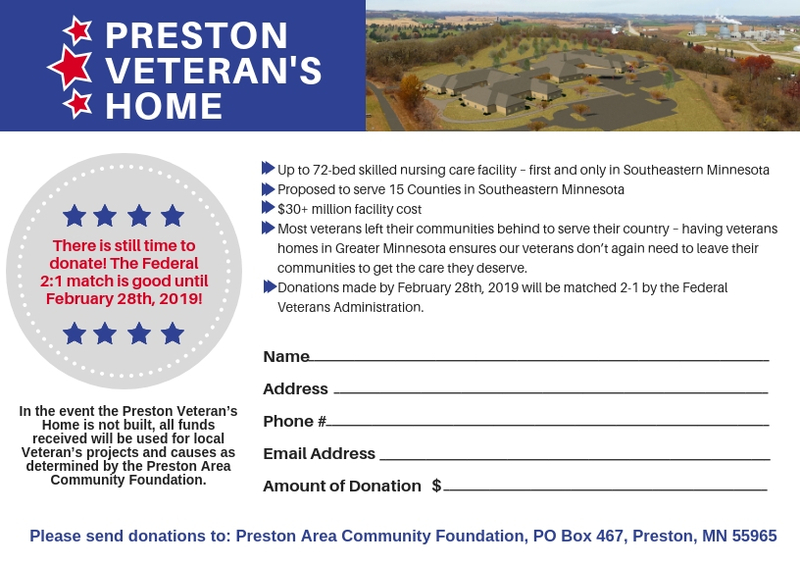 On Thursday, December 6, the Preston Veterans Home Committee, the State of Minnesota, Minnesota Department of Veterans Affairs and the Veterans Home Design Firms, Wold and Perkins-Eastman, will be presenting the Preston Veterans Home concept plans to the community. The community meeting will be held at the Preston Servicemen’s Club and will begin at 10:30am and last until 12:30pm. The Committee would like to extend this invitation to the any donors, Veterans and residents in Southeast Minnesota. This will be a great time for community members to see what the development of the Veterans Home will look like at the conceptual phase of design. The Preston Veterans Home will be a 54-bed skilled nursing care facility. The Veterans Home will serve 15 counties in Southeastern Minnesota. The Preston project is projected to cost just over $30 million. A federal application for the remaining construction costs will be sent in April of 2019. Ground breaking is expected to take place in late Fall of 2019. For more information on the Preston Veterans Home Project please go to the veterans home page. How you can contribute to the building of the Preston veterans home! The Preston Veterans Home will be a skilled nursing care facility with up to 72-beds and will be the first and only in Southeastern Minnesota. The cost of the facility will be $30+ million. The design firm, Wold, is working with local residents from the Veterans Home Committee to design the Veterans Home. The independent demand study shows if built today, 224 Veterans would reside in the Veterans Home. In 2040 that need will continue and the projected need is for 111 Veteran’s beds. 42,323 Veterans live within the 15 county catchment area of the Veterans Home. Our Veterans earned the right, through service to our County, to be cared for at the future Veterans Home. The State contribution of $10.2M, the local donations of $1,065,000 that were donated by September 28, 2018, along with a Federal match of $22,530,000, dictate the size and amenities of the new facility. The current fundraising drive is above the local City and County commitment. In order to receive a 2 to 1 federal match and build to the needs of the catchment area we continue to raise additional funds. Donations pledged and received after September 30, 2018 will still receive the Federal 2:1 match if received by February 28, 2019. Donations continue to be accepted, but will not be considered for the overall size of the Home. In-kind donation will also be considered by the MDVA. Please see the donation card below if you would like to donate and if you have any further questions you can reach out to Joe Hoffman, Preston City Administrator, at 507-765-2153. Most veterans left their communities behind to serve their country. Having veteran homes in Greater Minnesota ensures our veterans don’t again need to leave their communities to get the care they deserve. Download and print the Pledge Card to send in your donation.